The draw ceremony was held in the presence of Sunil Gulati, FIFA Council member, Praful Patel, President of the All India Football Federation and Vijay Goel, Indian Minister of Youth Affairs and Sports. 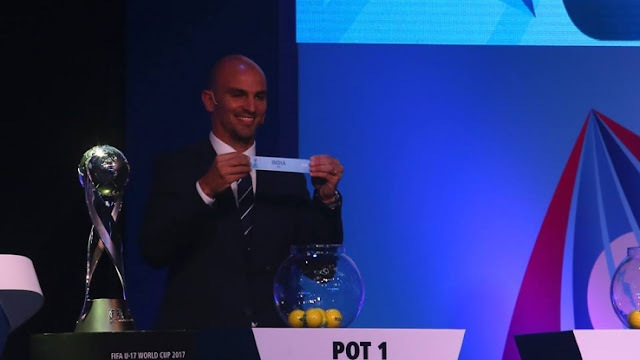 Assisting in the draw ceremony were FIFA Legends Esteban Cambiasso and Nwankwo Kanu, as well as Indian national team legend Sunil Chhetri and Indian badminton star Pusarla Venkata Sindhu. Group B Comprises of Paraguay, who finished 3rd in South America U17 Championship. African Champions, Mali also find themselves in this group. New Zealand and Turkey complete the group.They will play their matches at Navi Mumbai's D.Y. Patil Stadium with one match to be played at New Delhi. U16 AFC Championship runners up, Iran have been drawn in Group C alongside African Nation, Guinea, Germany from UEFA and Costa Rica from CONCACAF. Five of their matches will be played at Goa's Fatorda Stadium with one being played at Kochi's Nehru Stadium. Brazil and Spain, both of whom won their respective Continental Championships, find themselves in Group D alongwith Niger and Korea DPR (North Korea). They will play their Group Matches in Kochi and Goa. Debutant New Claedonia from Oceanic Football Confereration have been drawn in Group E with Japan, Honduras and France. They will be based in Guwahati and play their matches in Indira Gandhi Athletic Stadium. Asian Champions, Iraq will be joined by CONCACAF Champions, Mexico in Group F with UEFA & CONMEBOL Runners up, England and Chile respectively completing the draw. They will be based in Kolkata and play their matches in Salt Lake Stadium.